EFJ has again achieved CHAS status (Contractors Health & Safety Assessment Scheme) and are continue to be an accredited contractor. EFJ had to pass a stringent health and safety assessment process to gain the CHAS accreditation. The CHAS health and safety assessment scheme is a pre-approval scheme to allow contractors to show potential clients that they meet the required health and safety standards. It is the largest and also the fastest growing health and safety assessment scheme in the UK. CHAS is a health and safety accreditation scheme for the construction industry, and often acts as a type of pre-qualification during the tender process. It is a national database of contractors who have been through a health and safety assessment, and have demonstrated compliance and management standards. The purpose of CHAS is to help both buyers and suppliers in the assessment of health and safety competence. Helping buyers by reducing the lengthy process of assessing contractors health and safety standards individually. Helping suppliers (contractors) by reducing the time consuming process on completing and submitting full details of health and safety processes on each project they compete for. EFJ first achieved CHAS status in 2015. More details can be found at www.chas.co.uk. We were delighted to hear this week that our recent assessment to renew our CHAS status (Contractors Health & Safety Assessment Scheme) was successful and we continue to be accredited. EFJ had to pass a stringent health and safety assessment process to gain the CHAS accreditation. EFJ first achieved CHAS accreditation in 2015. East Fife Joinery have just run a training course for 6 operatives on slinger/banksman. 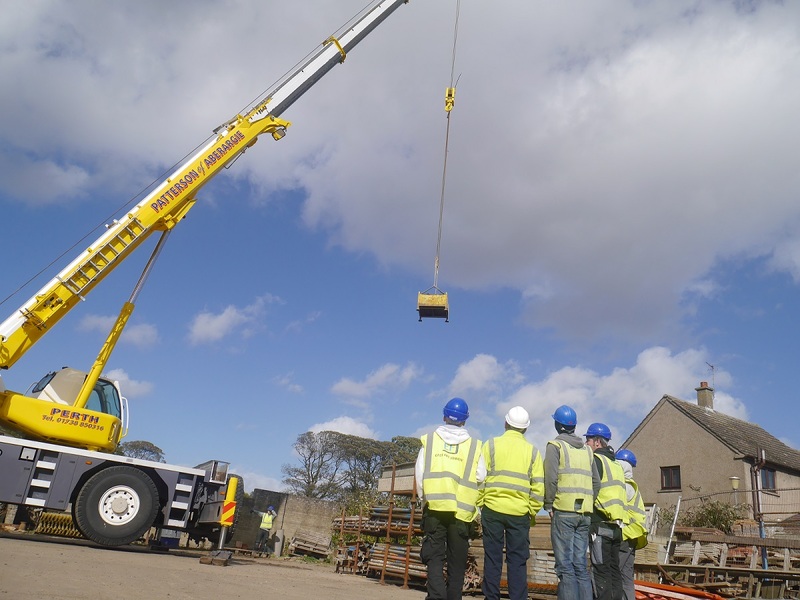 This is part of our continued commitment to Health and Safety Training for all operatives. All our operatives have construction skills safety cards and have asbestos awareness training. In addition to this they undertake an annual review of any training required and courses are run on a monthly basis on various subjects. In addition to this toolbox talks are held weekly on site.